Please enter your email address and click the Follow button to follow Chrissy Peebles! This is book 4. A curse is unleashed upon the land. When the vampires can't feed, they are ravenous with hunger. A war breaks out between the vampires and the wolves, and raging chaos ensures. Can Sophie stop it before all is lost? This is book 3. Sky has made it to the surface and is shocked at her new life. As she tries to survive and adjust to her new life, she never gives up hope. This is book 6. On the hunt to take down the Falcar and stop Halo from rising, Sophie stops at nothing, even risking her life as she travels to a lost city in the Rainforest to obtain an ancient sword. This is book 4, the conclusion of this series. No matter what the cost, Sky fights to get her world back. She vows to have the life she has always dreamed of. Can she have a normal life? 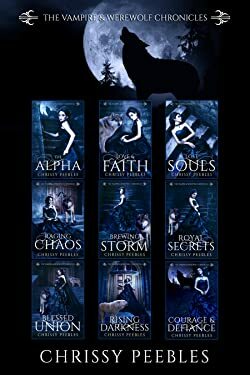 Jump into a fantasy adventure, time travel romance from USA TODAY bestselling author Chrissy Peebles.This is book 7 and the last book in this saga. Sarah and Victor are home in Tastia and ready to claim their kingdom. But will they be able to defeat Ethano and his forces? Can they get the castle back and live happily ever after? When Faith and Matthew discover a bird's nest, they come back every day and take pictures. Faith explains facts to her brother about Robins. This is an educational children's storybook about Robins as they follow the birds from egg to spreading their wings and fledging. When an enemy unleashes demons on Black Shadows, Julie is forced to fight for the ones she loves. With destruction all around her, can she save her beloved community?